KOA campgrounds are not RV resorts but are quality campgrounds and, while costing a bit more, are preferred by most RVers especially those with larger rigs. However we occasionally find a KOA that does not live up this standard. 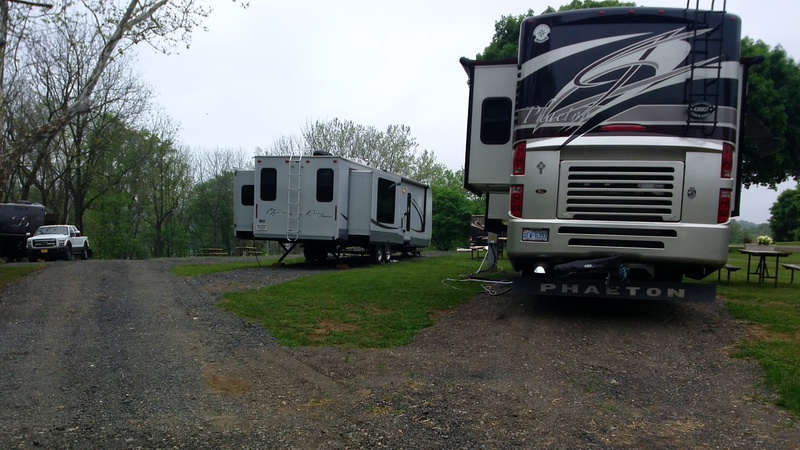 The KOA in Coatsville, PA is not worth the trip. Oh, the staff is genuinely friendly and helpful as much as they can - no problem there. The problem is the location of this campground. There are no good roads that lead to this campground. These roads have not been widened since they were built in the 18th century. 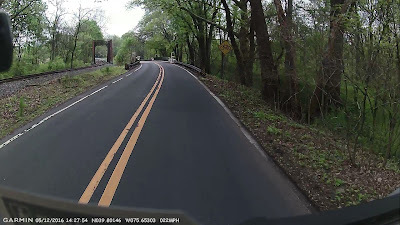 They wind with hair pin turns and most have no shoulders, trees growing out into the pavement means large vehicles will have a difficult if not damaging experience. The KOA staff was very apologetic. 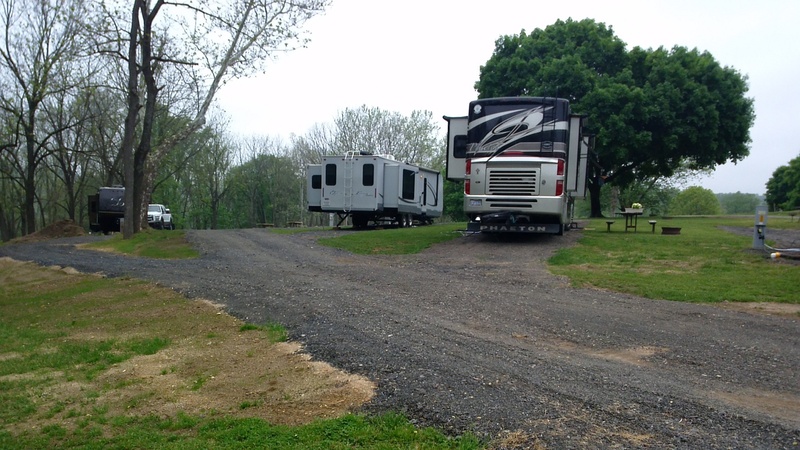 It is a sweet little campground on the side of a mountain but all of us campers with big travel trailers, fifth wheels and diesel pushers are not happy. I hope no one is coming at us. 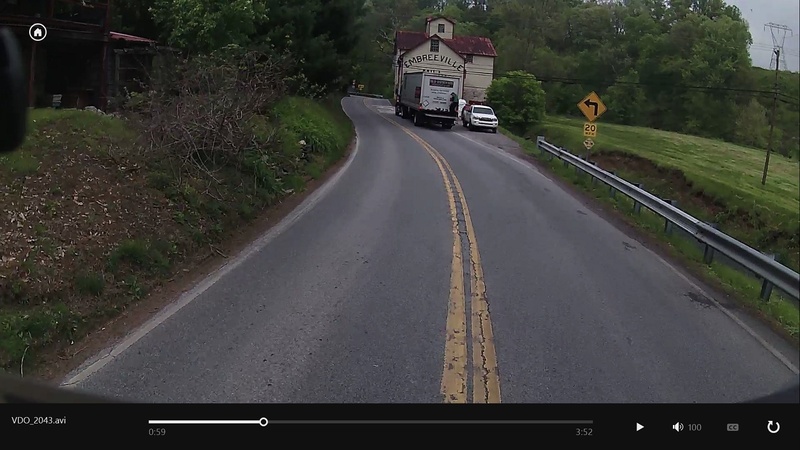 This tractor trailer was stopped, making a delivery at the building in the shot. I found myself driving on the wrong side of the road due to large tree branches growing on my-side of the road. There is room for a bicycle here? OK, here is where had to stop. I need 13 feet clearance. 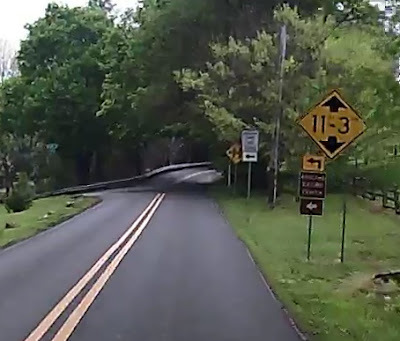 The sign says 11' 3". So while I am out directing traffic around us, Joanie calls the KOA asking their advice since we were following their on-line directions to the campground. 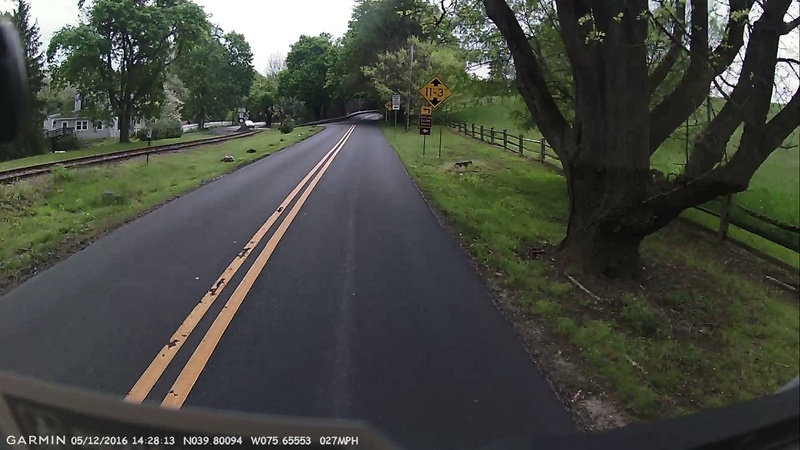 We finally got ahold of someone who pulled up our location on his computer and said he knew this road and did not know of any covered bridge or overpass so did not understand the sign we were looking at. So based on that comment, I decided to follow the road to the right, carefully, prepared to stop again, unhitch and back up. I have driven Phaeth through the winding roads of the mountains of North Carolina and Tennessee and never encountered the difficulty we had yesterday. Low branches sounded like they were tearing off our air conditioners and satellite dish. So here is evidence that we made it to the campground on the mountain. The campsites are not level. You can see that we are not the only ones in this section with the end of our rigs way off the ground. We have been on un-level sites before but never with our rear axel on the downward slope. 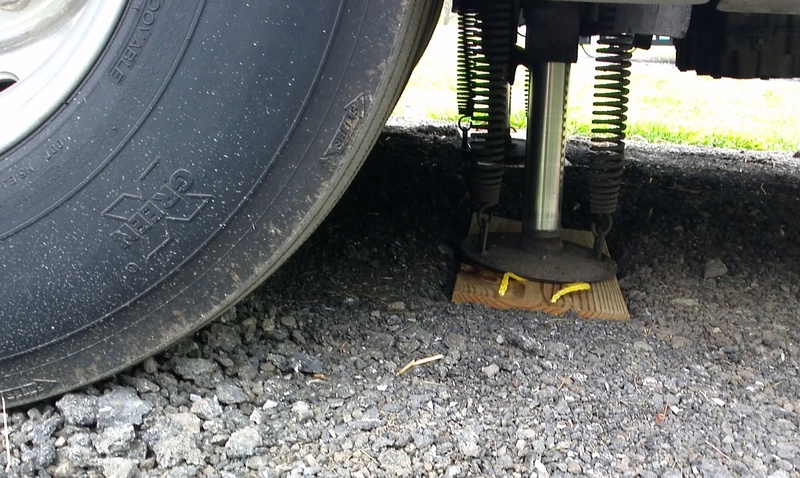 While we have leveling jacks for this reason, you cannot lift the wheels of the rear axel off the ground since the parking brake is on those wheels and you definitely don't want to roll off your jacks down the hill. Because Joanie is vertically challenged, I asked her if she wanted to walk under the back of the coach and do an oil change for me. She actually chuckled at my little joke. OK, a couple of other issues with this RV park: When we pulled in, we had no electricity at the post for our site. The circuit breaker for the 50 amp service had gone south. I hooked us up to the available 30 amp plug and called the campground office once again. They again apologized and replaced the breaker. Then this morning I noticed we were sinking into our site adding to the downward slope. I tried to adjust for the sinkage with our rear leveling jacks. We can't play marbles on the floor inside. We have gabbed with several other campers here and to the workampers who reiterated their own experiences getting here and our exit from this place is no more promising that what we encountered yesterday. Oh, well... 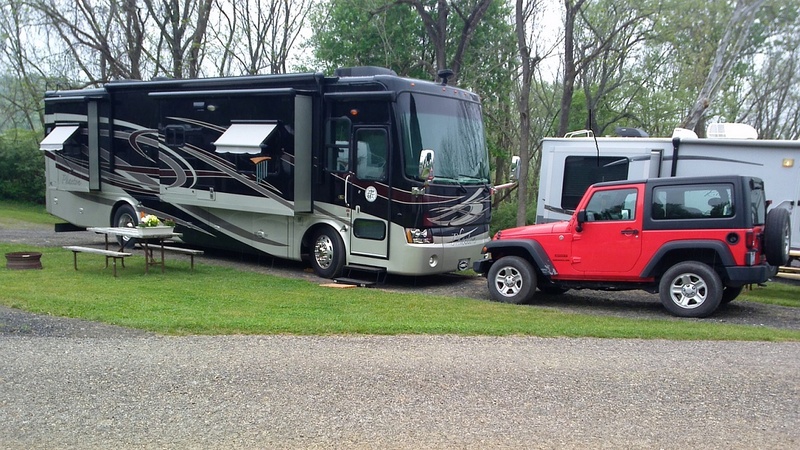 Such is the life of a full time RVer.